An investigation carried out by the BBC has determined that there is proof that Syrian President Bashar al-Assad has launched 164 chemical attacks on his own people since 2013. President Assad denies the allegations. In September 2013, Assad signed the Chemical Weapons Convention (CWC), which stated that he agreed to destroy the countries stockpile of chemical weapons. This cam a month after an attack using the nerve agent Sarin left hundreds dead in various suburbs of Damascas. Almost half of the attacks were in the Idlib and Hama provinces, with Aleppo third, and Damascus fifth. The use of these chemical weapons has been described as “vile” by Karen Pierce, the UK’s permanent representative to the UN. Assad strongly denies all allegations of the use of chemical weapons, and assures they were destroyed in 2013, calling it a “farce”. “We don’t have any chemical arsenals since we gave them up in 2013, and the Organisation for the Prohibition of Chemical Weapons (OPCW) made investigations about this and it’s clear and documented that we don’t have [chemical weapons]. “Let’s presume that this army has chemical weapons and it’s in the middle of war. Where should they be used? At the end of the battle? They should use them somewhere in the middle or where the terrorists made advancements, not where the army finished the battle and the terrorists gave up and said: ‘We are ready to leave the area’, and the army is fully controlling that area. “The Western narrative started after the victory of the Syrian army. Not before. When we finished the war, they said we used chemical weapons. “Why do all the supposed chemical weapons only kill children and women and don’t kill any militants? If you look at the videos, it’s completely fake, I mean, when you have chemical weapons, how could the doctors and nurses be safe dealing with the chemical atmosphere without any protective clothes, without anything, just throwing water at the victims and the victims became okay, just because you washed them with water? 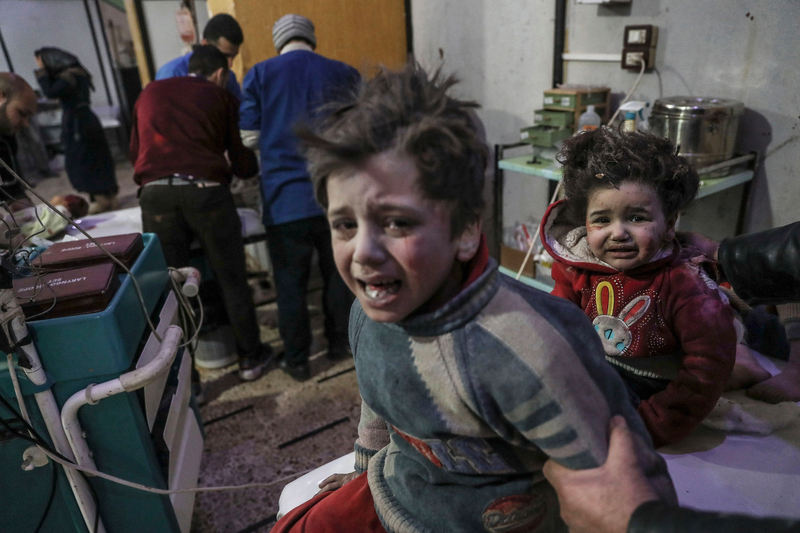 But, the OPCW have admitted that there are “gaps, inconsistencies and discrepancies” in Syria’s declaration that a team of investigators is still trying to resolve. Syrian’s on the front line still claim that chemical weapon attacks are happening. Abdul Hamid Youssef lost his wide, his 11-month old twins, two brothers, his cousin and many neighbours in an attack on 4th April 2017. A joint mission between the OPCW and the UN concluded that both sulphur mustard and Sarin were used, in a finding that “deeply concerned” the Leadership Panel. The panel also encouraged the “international community to make united efforts to ensure that such use will not be repeated”. Karen Pierce claims that President Assad will be brought to justice at some point over the attacks.